There are a few fresh ingredients that are undeniably “summer” to me, and when they’re at the forefront, there’s no need to extraneous ornamentation… the flavors just come out on their own. Peaches and tomatoes are among these, and if you haven’t tried them together, now’s the time. Cut the drained tofu into 3/4-inch cubes Mix the remaining tofu ingredients in a small container. Add tofu and marinate for at least 6 hours. When ready, heat the barbecue to low. Cover the grill with foil. If your peaches and tomatoes are very firm, you can grill without the foil. Place the peaches and tomatoes on the foil and grill for about 3 to 5 minutes per side, until beginning to brown, fragrant, and emitting juices. Use tongs to transfer to a serving dish. Place the tofu on the foil. Grill for about 3 minutes per side of the cube, until browned. 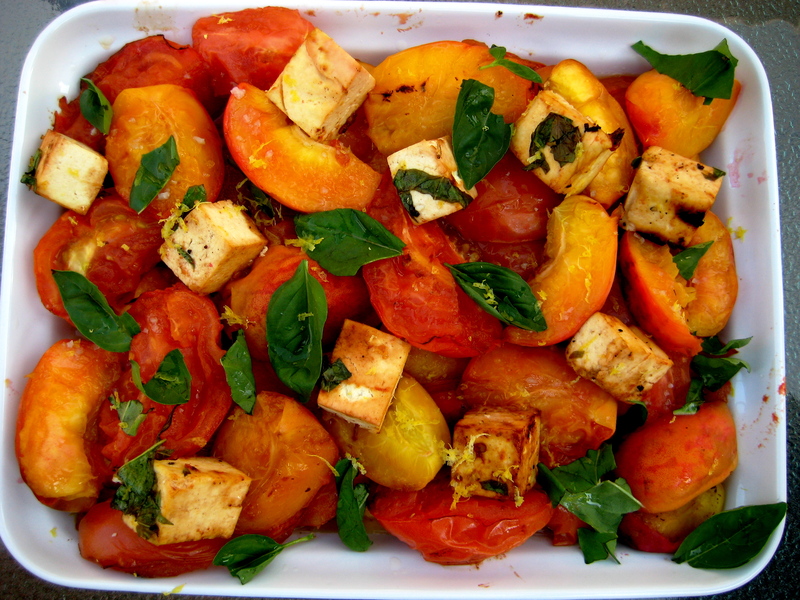 Top the tomatoes and peaches with the tofu. Garnish with basil. Serve warm. looks so good……picture is awesome! Pingback: Millions of Peaches, Millions for Me, Millions of Peaches, I picked them for free. | meshell in your city.